Hey friends, I've been so busy with VBS (Vacation Bible School) I feel like I've been out of touch this week with my blog, my craft table and all my creative friends so Hello and I'm so happy to be back! It's been a great week and I'm fortunate that I made this crafty project before the crazy busy week began! So, this week at Hiding In My Craft Room our theme is Free Style, aka Anything Goes! About a month ago I saw this idea in blog land and my apologies to the brilliant lady who thought of it! It's a pencil/art supplies/ flower holder-vase and its super simple to make! 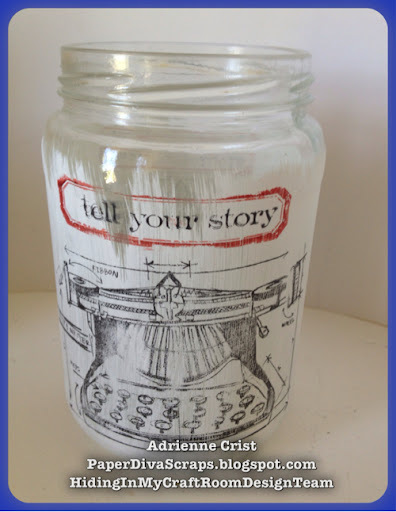 So you can use a mason jar or a cleaned out pickle jar, wipe or brush stroke on some gesso to the outside. It dries pretty quickly but I let it set for a few hours then came back to it. 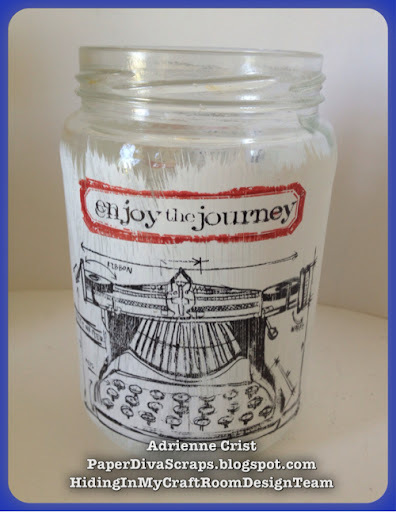 I then took my Tim Holtz Stampers Anonymous Vintage Things stamp set, applied Staz-On ink in black, and used the stamp without a block to wrap the stamp around the curve of the jar to create my image. It's not perfect but my daughter thinks it looks mor vintage like in its imperfection, I'll go with that! I also used the Tim Holtz SA Vintage label stamp with Red Archival ink for that image. That's it, easy peasy and so cute! I will be putting this on my desk in my officer. What a cool project! Thanks for joining us at SACC! This is such a super cool project! WOW I really like it, and I appreciate having you share your art in our challenge this week. Blessings to you, and please join us again soon! I like it-! This is a great idea. Thank you for sharing your talents with us at Stampotique Designer's Challenge. What a seriously clever idea and I think you have made it look honest vintage. I remember Mommy and those old Remington typewriters. I'm thankful to have seen this great idea. This is awesome! I would love to try this technique sometime. Thanks for joining us at Crafting By Designs. What a creative project. Fabulous. So cool, what a fabulous idea. Thanks for joining us at Left of Center Challenges this week.